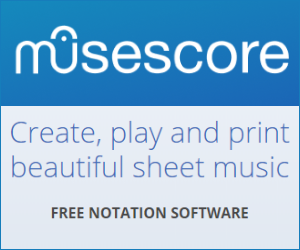 In piano music, if there is a chord on the treble clef, and some the notes are to be played with the left hand(because it would be hard/impossible to play with one hand alone), how would one go about notating this? What are "too many ledger lines"? Looks perfectly feasible to me. If you want to move them to the upper staff, don't let them share stems with the notes to be played by the right hand. Instead, the stems for right hand point up, and those for left hand down. Once you do that, your "too many ledger lines" solution takes not significantly more space. In fact, when the right hand stems don't need to point up, it might even take less. If you really want to use the upper staff, however, use chord brackets for the respective hands. This is an example for such brackets though not in the context of hand distribution of notes. Here are some suggestions. It could be argued that the lines and text in the first two merely confirm the obvious. 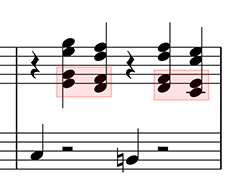 The lack of tails in the first example obscures the fact that (using Sibelius) they actually ARE Cross-Stave Notes, as evidenced by the lack of extra rests. Where there ARE beams, as in the third example, there's no room for ambiguity. I would use the bass clef for the lower thirds in your passage. 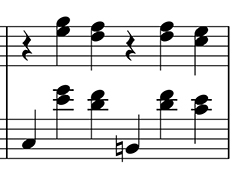 Three ledger lines above the bass clef (and three below the treble) are quite common in music. It all comes down to what's easiest to read. In your first, I have to mentally break the notes apart, and I don't have to in your second so the reading is automatic. The second passage is easier to sight read. For some ideas, have a look at Brahms' Intermezzi, in particular Op. 117 No. 2 (which you can find here. It has a lot of broken chord passages in the left hand, that run well up into the treble clef and back down to the low notes. You'll see that he doesn't have any hard and fast rules about which clef he puts notes in; rather, he has them in whichever clef is easiest to read. If you study this, you should begin to see reasons that he chooses one over the other.